Following its preview at CES 2014, ASUS is excited to launch the ASUS RT-AC87, the world’s first Wave 2 802.11ac consumer router and the fastest 5 GHz with speeds up to 1.73Gbps. Powered by Quantenna’s award-winning QSR1000 4×4 Multi-User Multiple Input Multiple Output (MU-MIMO) chipset, the ASUS RT-AC87 offers unparalleled speed and range for a superior wireless experience. “As the number of wireless devices in the home increases, so does the importance of Wi-Fi quality. Our customers value high-performance Wi-Fi and know the importance of a reliable and fast wireless connection in order to stream bandwidth-intensive data. The RT-AC87 provides them with class leading performance, as well as incredible range and reliability,” said Margaret Chen, President of Open Platform Business (OPBG) Group for ASUS Computer International. The RT-AC87 utilizes four external antennas and Universal Beamforming to maximize range throughout the home or office, improving signal strength and performance even to older 802.11a/b/g/n clients. Capable of reaching speeds up to 1.73Gbps , the RT-AC87 is ideal for HD-grade video, ultra-low-latency gaming and heavy file sharing. Its breakthrough MU-MIMO technology enables it to stream rich content to multiple devices in every corner of a home, in Full 1080p or 4K Ultra HD resolution. With MU-MIMO1 , the RT-AC87 can form groups of multiple devices that can be served at the same time, simultaneously. Previous 802.11n and 802.11ac routers can stream to only one device at a time. MU-MIMO greatly increases the efficiency of the Wi-Fi network, mitigating potential bottlenecks as more devices are connected to the access point. Furthermore, the RT-AC87’s multiple antennas, coupled with its advanced beamforming, reduce the transmission’s signal-to-noise ratio and improve the reliability of the Wi-Fi signal, providing a better overall wireless experience. The most advanced built-in parental controls in mainstream routers today, RT-AC87 features AiProtection with Trend Micro that uses real-time network monitoring to detect malware and other intrusions before it reaches your PC or device. With extensive testing and development across all networking products, RT-AC87 is specially-designed to work with adapters, media players and other wireless devices to deliver the best performance – even supporting the latest gen gaming consoles Xbox® One and PlayStation 4. Pre-installed with RT-AC87 is the enhanced ASUSWRT user interface that gives you access to the 30-second, web-based installation process, AiCloud 2.0 and many more advanced wireless management options. ASUSWRT is web-based so unlike other routers that require separate app downloads or limit what you can change via mobile devices, you get access to everything from any device you can connect to the router. ASUS AiCloud 2.0 is an exclusive application that turns the router into a powerful personal cloud server. Files stored on the network, on attached USB storage devices or on ASUS WebStorage are effortlessly synchronized using the ASUS Smart Sync feature. Easily share files with friends, colleagues and family members simply by sending a link via email, text message or popular social-networking apps. Users can access their data via the AiCloud web interface or the free AiCloud app for Android and iOS devices — so they can sync, share and stream content anywhere. 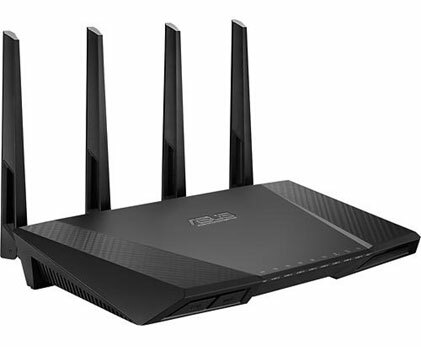 The ASUS RT-AC87 router will be available in North America shortly for an estimated MSRP of $269.99.